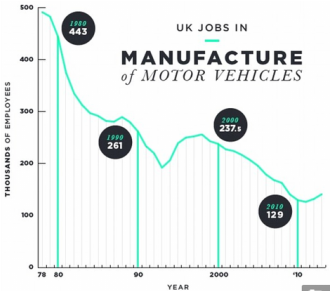 Consider how the importance of manufacturing based in the UK – for example, in terms of its scale – is changing over time. Where do the UK's economic strengths lie? Manufacturing’s share of the total economy is certainly in decline, because services have grown more quickly in recent years. Likewise employment in the sector has been shrinking, as a result of significant and essential productivity improvements, which are in fact a ‘good news’ story for the sector. 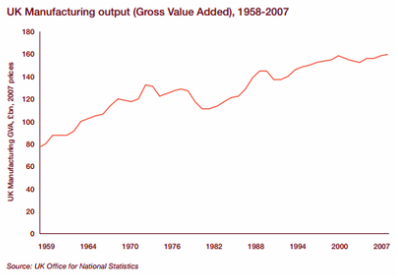 The real value of UK manufacturing output has increased in 35 out of the past 50 years, and as the graph below proves, 2007 was a record year for UK manufacturing production. than that for the whole economy, and as a consequence the proportion of whole economy Gross Value Added (GVA) accounted for by manufacturing has fallen since the early 1950s. Manufacturing contributes £6.7tr to the global economy. Contrary to common belief, UK manufacturing is strong with the UK currently the 11th largest manufacturing nation in the world. 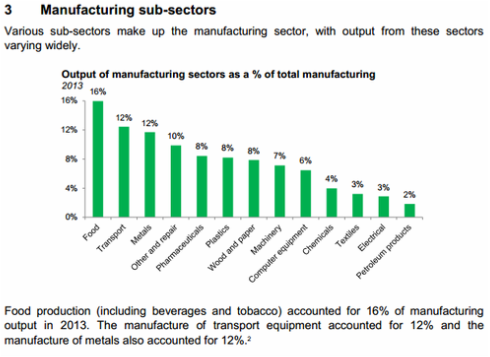 Manufacturing makes up 11% of UK GVA and 54% of UK exports and directly employs 2.6 million people. Despite the decline since the 1970s, when manufacturing contributed 25% of UK GDP, the UK ranks second globally in aerospace manufacturing. In the half-year from January to June 2014, the UK-based car industry had its best year in new car sales in 9 years. 1.28 million new cars were sold during the period, a rise of 10% compared to the same period in 2013. While the chemical and pharmaceutical industries add £20m per day to the UK balance of trade. Underpinning these important statistics is an average annual productivity increase of 3.6% – two and a half times greater than the UK economy as a whole. While the contribution of manufacturing to GDP has declined on paper, many of the services provided to manufacturers which would have once been considered part of manufacturing, such as catering, cleaning, building services, security etc, are now allocated into different areas of the economy. However, those contributions are directly reliant on manufacturing for continued business and could actually be considered as a part of manufacturing’s GDP input. What does the UK aerospace industry look like today? The automotive industry accounts for 4% of GDP (£60.5 billion) and currently provides employment for more than 700,000 people in the UK. The UK produced 1.6 million cars and commercial vehicles and almost 2.6 million engines in 2013. 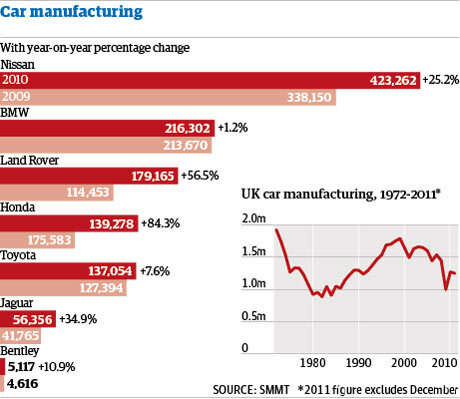 The UK is now the second largest vehicle market and fourth largest vehicle manufacturer in the EU. It is also the second largest premium vehicle manufacturer after Germany(1)(2). 77% of vehicles produced in 2013 were exported(2).The average value of vehicles imported in 2013 was approximately £13,000 compared to an average of £20,600 for vehicles exported, meaning that the balance of trade for vehicles is £70 million net export(3). 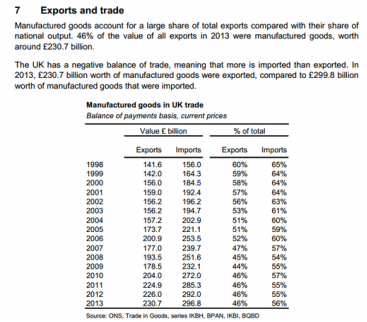 Automotive is one of the largest export sectors in the UK, accounting for 10% of total UK export in goods. The UK benefits from a diverse mix of luxury, premium, volume and commercial vehicle manufacturers and suppliers, and is also home to eight F1 teams. The UK is the fourth largest global manufacturer of construction equipment (off-highway vehicles), producing approximately 60,000 units per year. Many of these companies are continuing to invest in the UK, with over £6 billion investment announced in the last three years. • Range Rover: Won 10 awards within three months of commencing production, and the Evoque has secured 22 international awards. • Nissan Qashqai: Winner of over 13 global awards. • MINI: The 12th successive year to be awarded Supermini winner at the BusinessCar Awards 2014. • McLaren: Winner of Best Super Car at the Middle East Motor Awards 2013. • Nissan LEAF: European and World Car of the Year in 2011 alongside 2012 Car of the Year Japan. 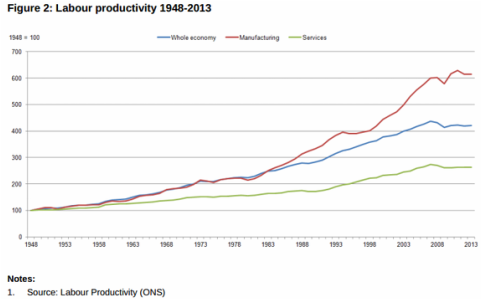 Manufacturing productivity has grown by 2.8% on average per annum since 1948 – compared with 1.5% in the services industry. 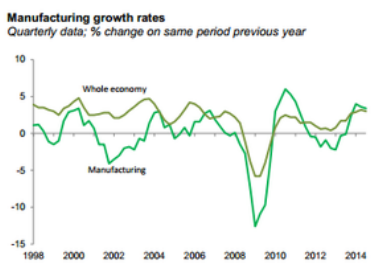 The 2008-09 economic downturn resulted in heavy declines in productivity in both manufacturing and services, neither of which have recovered to pre-crisis trend growth rates. 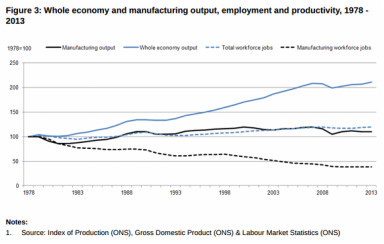 Figure 2 shows the impact is greater for manufacturing, but nevertheless, over the long term, manufacturing productivity continues to compare favourably to that in the services industry and the economy as a whole. 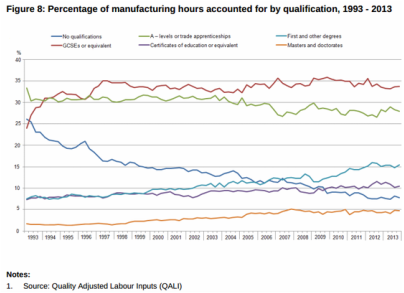 Figure 8 shows that the proportion of hours worked in the manufacturing industry accounted for by workers with no qualifications has fallen significantly from just over 26% to 8% since 1993, offset to an extent by a noticeable increase in graduates. The same trend is visible across the wider economy, but to a lesser extent (especially trends in hours accounted for by workers with no qualifications). 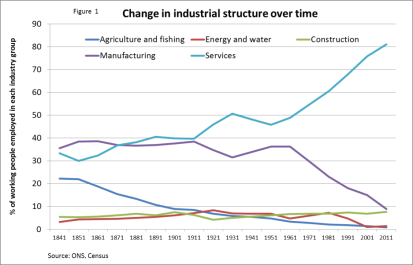 Jobs have reduced markedly across all manufacturing sub-industries since 1978. The falls in jobs in textiles have been particularly strong – with a reduction of over 80% in jobs between 1979 and 2013 (Figure 5). 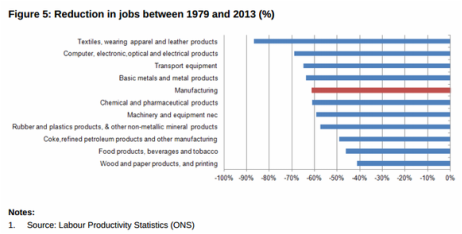 Jobs in the ‘wood and paper’ sub-industry has been the most resilient of the manufacturing sub-industries, falling 40%, although this is still large when compared to most services sub-industries, which have mainly increased jobs over the period. 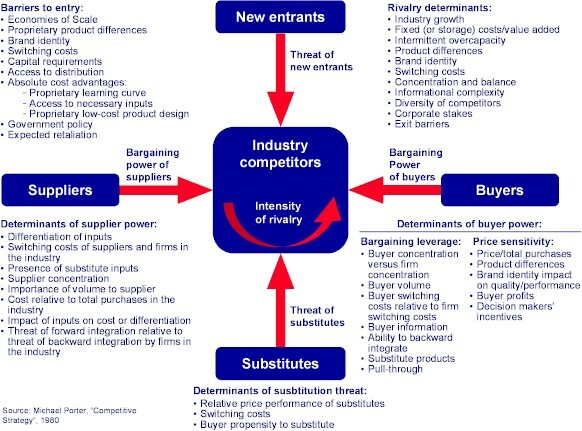 Another possible factor is the large investment in research and development (R&D) on manufactured products, which is often cited as a key determinant of multi-factor productivity. This accounted for just over 70% of all business R&D expenditure in 2012, despite the manufacturing industry only accounting for 10% of the economy in GVA terms. 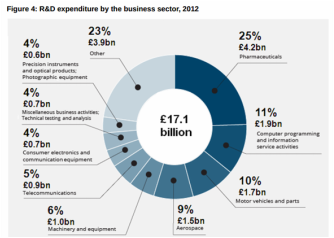 R&D expenditure on manufactured products represented 3.4% of manufactured product sales in 2012. This compares with R&D expenditure on service products which represented 0.1% of turnover in the service sector in the same year. This is broadly comparable for 2010 and 2011. 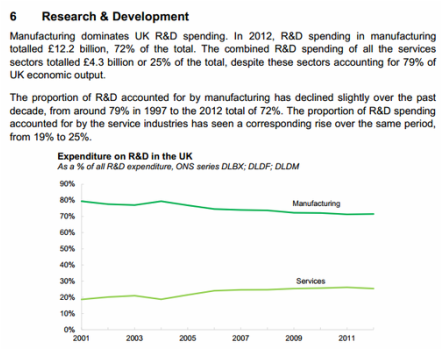 Manufacturing R&D investment is primarily driven by spend on pharmaceutical products (33.8% of product sales in 2012). Other products that are invested heavily in include computers & peripheral equipment (10.1%) and consumer electronics and communications equipment (27.6%), as shown in Table 1. Data on R&D investment in manufactured products have been available for many years, but R&D investment in service products as a share of turnover for the sector have only been available since 2010. 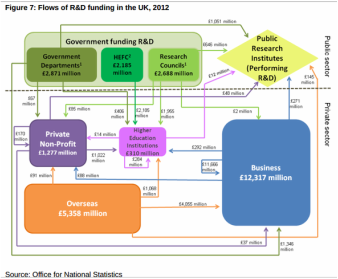 Manufacturing R&D investment has increased from £9.7 billion in 2001 to £12.2 billion in 2012; this has resulted in an increase in expenditure as a proportion of manufactured product sales from 3.2% to 3.4% over the period. This increase in R&D investment may be a driver of manufacturing productivity growth. 7. Funding and technical help is available from various areas of the automotive sector. The Automotive Council was established in 2009 as a collaborative partnership between industry and government to shape the future of the UK’s a0utomotive industry. Bringing together senior executives from across the industry, the work of the Council is channelled through three working groups: the Supply Chain Group, the Technology Group and the Business Environment and Skills Group. With top-level political and industry support, the Council is able to support the UK’s dynamic, innovative and cutting edge automotive sector.